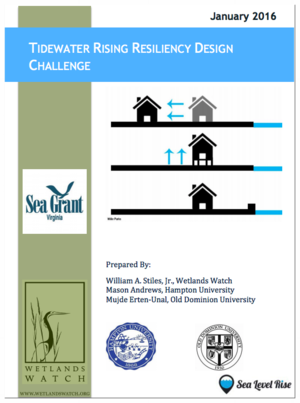 Wetlands Watch collaborated with Virginia Sea Grant and the US Green Building Council: Hampton Roads to bring students from Hampton University and Old Dominion University together and develop resiliency designs for the historic shoreline neighborhood of Chesterfield Heights in Norfolk, VA. Student designs were made part of the region's proposal for the Department of Housing and Urban Development's National Disaster Resilience Competition, and at the beginning of 2016, designs based on the students' work won a $120 million grant for the state of Virginia. Most of the HUD funding- $115 million will be put on the ground in Chesterfield Heights to implement those ideas. The design competition team was awarded the 2015 Norfolk Environmental Action Award for their efforts.